CindyScript has an internal clock that provides access to the current date and time. The clock can be also used to synchronize some automated animations. Furthermore, an operator is provided that is synchronized with the current timestamp of a running animation or physics simulation. Description: This operator returns a list [h,m,s,ms] of four integers. The four values correspond to "hour," "minute," "second," "millisecond" on the computer's clock. 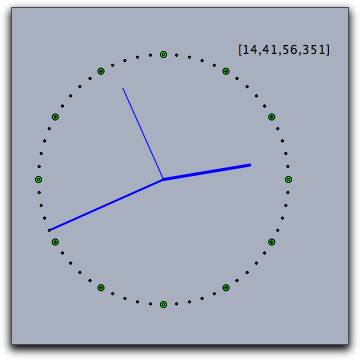 Example: The following code produces a simple clock on a Cinderella view. The variable t contains the time information. The subsequent code is used to produce a clocklike drawing on the view. An auxiliary function p(w) is defined that produces points on the unit circle. The code must be placed in the "Tick" section of CindyScript in order for it to run continuously. Description: This operator returns a list [y,m,d] of three integers. The three values correspond to "year," "month," and "day" on the computer's calendar. Description: Returns the time elapsed since the last evaluation of resetclock(). The time is scaled in a way such that one unit corresponds to one second. The time's resolution is on the millisecond scale. Description: Resets the value of the seconds() operator. Description: This operator gives a handle to the running time clock synchronized with the progression of an animation or simulation. Caution: This operator is still experimental. Description: Will completely halt every script execution for a number of milliseconds as given by the parameter. Example: The following code produces an acoustic jingle. Description: This statement starts the animation. Also physics simulation in CindyLab depend on running animations. Description: This statement pauses the animation. Description: This statement stops the animation. Stopping an animation also causes the geometric elements to be restored to there original position. Contributors to this page: Kortenkamp , Richter and Kohler . Page last modified on Monday 05 of September, 2011 [09:10:13 UTC] by Kortenkamp.